After five days of Stuff-Your-Face-Fest 2013 in NOLA, we packed Loretta up and made our way towards Houston. And because we hadn't eaten enough fried, creamy, fatty, meaty, flavor-tastic food in New Orleans, we took a quick detour off Interstate 10 to Krotz Springs, Louisiana to get ourselves the best boudin balls in the state. What are boudin balls, you ask? We didn't know. Emily P. suggested Billy's Diner, a gas station/convenience store in a tiny town, and said they were the best in the country. That's enough convincing for us. About two hours after leaving NOLA, we arrived at the average-looking gas station. Inside was your basic regular convenience store, but there was a sign above the counter with a menu: boudin balls (pepper jack stuffed or regular), cracklins', and boudin. I ordered two cheese-stuffed and two regular; the clerk plucked four fried balls from the case, tossed them in a paper bag and offered to heat them up. Yes please. At a dollar and twenty cents a piece (I KNOW), I should have bought the whole batch. Once back in the car, we quickly found out how delicious and incredible boudin balls are. About the size of your fist, the outside has a salt and peppery, greaseless, chicken-fried coating. The first bite reveals insides of aggressively-seasoned and slightly spicy rice, boudin (a white, Cajun pork sausage) bits, and green peppers. Upon the third bite, a molten core of pepper jack cheese in compromised and your mouth is bursting-at-the-seams happy. 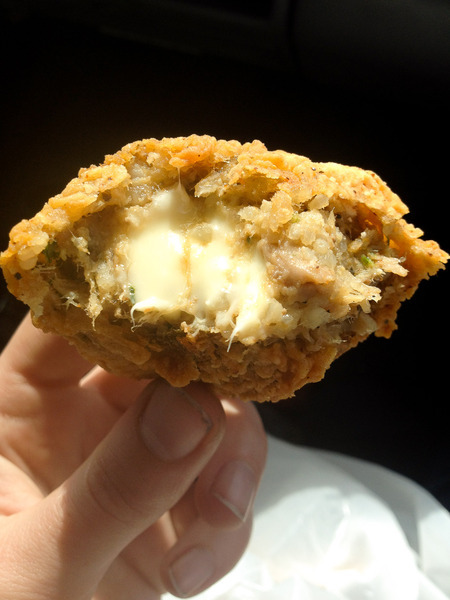 The combination of crispy fried shell, hearty meat-rice-veggie filling and oozy cheese is the epitome of Cajun cuisine rolled into a deliciously unhealthy little ball. It's the perfectly terrible-for-you, totally delicious and compact Louisiana meal. Absolutely, one hundred percent worth the detour. Special thanks to Emily P. (who suggested Boudin Balls) for making this blog post possible!